To impact lives for eternity through the Word of God and the Holy Spirit. To make disciples for Christ. God ordained and founded from the foundation of the world and we came into existence in May 1908. We believe that the Bible was written by God and every word is true and absolute, and you must be born again and a baptize believer in our Baptist faith. Mt. Sinai Missionary Baptist Church was temporarily organized April 29, 1908 in White Springs Baptist Church, with Brother Jerry Adams as Moderator. The following were elected as the first officers: Sister Rosa Parker, Secretary, Brethren A. Spingner and Richard Foy, Deacons, Sister Mary Seymore, Treasurer and Brother Andrew Jones, Trustee. On Tuesday May 5, 1908, the following churches and a few members met in a small house on Davis Street to form the permanent organization Dayspring Baptist Church, Reverend H. C. Williams, Pastor, Harmony Baptist Church, Reverend Irvin, Pastor, Philadelphia Baptist Church, Reverend F. C. Cohen, Pastor. Members were Reverend James Davis, Sisters Mary Seymore, Rebecca Brown, Bertha Gibson, Annie Nesbitt, Alice Hemby and Millie Williams; Brethren John Moore, John Adams and sixteen others. Reverend Davis served as the first pastor from 1908 until 1931; at this time, the church moved from Davis Street to Lee Street. After the death of Reverend Davis in 1931. God sent and the Mt. Sinai called Reverend H.H. Robinson, one of her sons in the ministry as acting pastor. In the month of January 1932, Reverend Robinson was installed as the regular pastor. Reverend Robinson served as pastor until March 30, 1962. From April to December 1962, Reverend B.F. Addison, one of Mt. Sinai’s sons was called to serve as acting pastor. Reverend Addison was officially called and installed as pastor in December 1962, and served until December 1966. On March 1967, Mt. Sinai called Reverend Vernal Thompson as pastor. Reverend Thompson’s pastoral services were ended because of circumstances over which he had no control. He had to return to his native country Jamaica; an accident took place in which he lost his life and he was unable to continue his service with Mt. Sinai. Finally, God sent a “Harvester” who came and stirred the dormant members through the preaching and teaching of God’s Holy Word. On February 20, 1968, one of God’s greatest leaders, Reverend Benjamin Jefferson Lane was called to serve as pastor of this flock. Because of failing health, Reverend Lane felt the need for a spiritual assistant. He approached his son in the ministry, Reverend H.T. Rhim, to recommend one of the sons in the ministry to assist him. Without hesitation, Reverend H. T. Rhim left the choice to Reverend Lane to make his selection. Reverend Lane readily selected Reverend Richard H. Curry, his grandson in the ministry, who began assisting Reverend Lane, March 12, 1995. Pastor Lane continued to lead us until God called him to his eternal home on March 16, 1995. Reverend Richard H. Curry stood by our side until God directed the membership to officially call him as the pastor of Mt. Sinai Missionary Baptist Church on July 25, 1995. He was installed as pastor on August 27, 1995. August 26, 1998 to March 1999, the Church was in prayer seeking divine guidance for a new pastor. Finally God sent and Mt. Sinai accepted and called our current Pastor, Reginald Leroy Gundy in March 1999. He was accompanied by his lovely wife, Wallette Williams-Gundy. They have one son, Andrew and two grandchildren, Darrion and Savia. Since Pastor Gundy’s arrival our church has grown tremendously in every aspect of ministry. 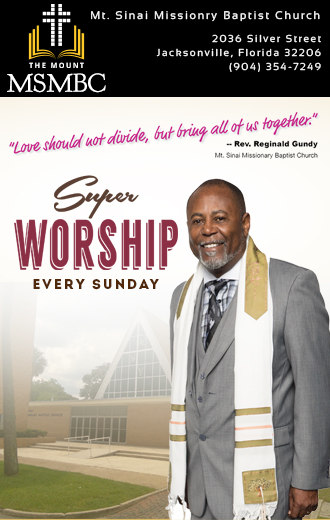 He is an absolutely outstanding pastor and leader of “The Mount.” Come see for yourself. Because of our pastor’s humbleness he would not allow us to post all that we have accomplished under his leadership. We thank God for our leader who is strong in the Word of God, teaching and leadership of the church and community. We are all better off because of Pastor Gundy’s commitment to Christ. Come see the church and man of God, you will not be disappointed.